This journey into the heart of Southeast Asia centres around the mighty Mekong River which you explore from the comfort of a bijou boutique river cruiser gaining you access to the smaller, lesser visited sights along this extraordinary waterway. 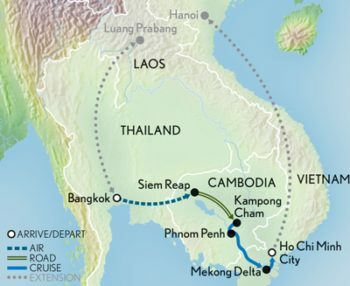 This journey into the heart of Southeast Asia centres around the mighty Mekong River which you explore from the comfort of a bijou boutique river cruiser gaining you access to the smaller, lesser visited sights along this extraordinary waterway. Discover serene Buddhist temples and ancient World Heritage listed sites, spirit houses and stupas and travel like the locals do by cyclo, sampan, tuk-tuk and trishaw. Hear from experts about the history, ancient and modern, which has shaped these friendly countries and meet the people who make them tick. Set off to explore the extraordinary temples of Angkor, a breathtaking city lost in the jungle and Cambodia’s most prized national treasure. Enter the monumental gates of Angkor Thom, where 54 gods and 54 demons are represented in an epic tug of war. Visit the Bayon Temple, with its 172 largescale faces wearing enchanting smiles, as well as the Terraces of the Elephant and Leper Kings. Later, walk to Ta Prohm Temple, an Indiana Jones-worthy fantasy with its crumbling towers and massive tree roots. Stay at Angkor Wat until sunset, marvelling as the diminishing, moody light washes over this unforgettable, faraway world. Explore the charming town of Angkor Ban, where you enjoy glimpses into the lives of local people, starting with a visit to a family home. Continue to the village school to observe the classroom experience. Stop briefly at the local monastery complex on your walk back to the ship. Ride Like a Local through Phnom Penh, Cambodia’s lush and alluring capital city, on an engaging cyclo tour. Discover the ornate Royal Palace and wander past huge stupas, spirit houses and potted flowers on route to the famous Silver Pagoda, home of Cambodia’s Emerald Buddha and the diamond-encrusted Maitreya Buddha. Visit the National Museum this afternoon. Later, learn about Cambodia’s darker days as you walk the notorious killing fields of Choeung Ek, one of history’s most infamous places. Then, leave behind that bleak period in Cambodian history to attend an uplifting, professional performance of Apsara, the country’s national dance, which you enjoy on board your ship. This morning, disembark at the village of Hoa An, well known for it's floral and craft industries. Here, guests have the chance to see how locals grow and use flowers and meet a family in their home. Later, re-board the ship and cruise downstream toward Can Tho. Unlike other river ships that are forced to dock outside of Saigon, ‘Mekong Princess’ takes you right into the heart of this lively, evocative metropolis, which today goes by the name of Ho Chi Minh City. Recently experiencing a resurgence of art and culture, the city is a hub of activity. Bid farewell to the crew of ‘Mekong Princess’ and set out to discover the city’s colonial legacy, including the Central Post Office. Continue your exploration with a visit to colourful Ben Thanh market. Then, drive past the former U.S. embassy building, from which helicopters carried off the last American personnel remaining on site before the city fell to the Vietcong in April of 1975. Observe as you go, the vibrant, bustling energy of a people on the move, wholeheartedly embracing the trappings of Western culture, as giant images of “Father Ho” gaze out at streets streaming with the latest-model luxury automobiles. Tonight, gather with your fellow guests for a special farewell dinner.